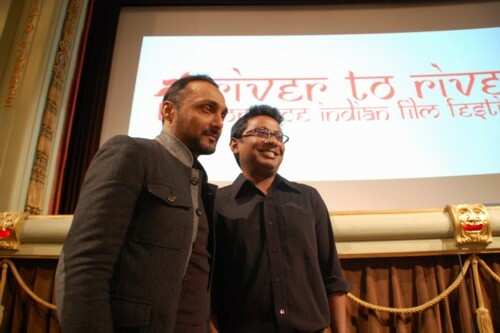 Note: In December 2010, during the River to River film festival in Florence (Italy) I did brief interviews with Aparna Sen, Rahul Bose and Onir. All the three interviews were very satisfying because each of them gave me an opportunity to meet and get to know some lesser known aspects of people I have liked and admired. However, I am really pleased with this Onir interview because it talks of some issues that resonate emotionally with me. I have also contributed to his new film "I am" by helping with the Italian subtitles. Sunil: Let us start with your new film "I am". The film was supposed to have five stories but in the end it has only four stories, what happened? Onir: Initially I was thinking of five stories. However, when I made the second film, I realized that it was going to be difficult because I wanted the entire film to be less than two hours. For the five stories, the time needed would have much more so I decided to limit it to four stories. Sunil: How did you decide which story to not to use in the film? Onir: The story I discarded, I was not too happy with the way it was shaping up. I felt that that story needed more space, it needed a full length film just for itself, to do justice to it. 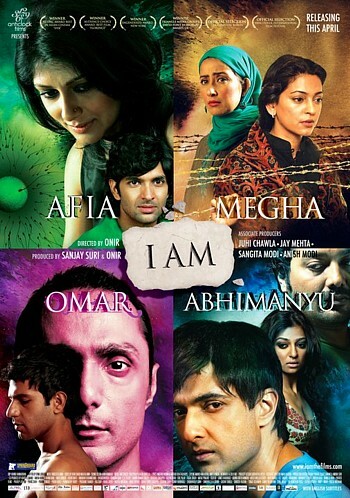 Sunil: Among the four stories of "I am" - Afia, Megha, Abhimanyu and Omar, do you have a favourite? Onir: I can't say! All the four are stories that I wanted to make into films. When it was difficult to get separate finance for each of them, I decided to make them together. Each part of the film has its own distinct character, mood and style, so each of them is special to me for a different reason. Sunil: You were born in Bhutan, so that means you are a world citizen. From a family that is originally from Bangladesh, then born in Bhutan and now settled in India. Increasingly, we all have mixed roots and identities. I have been to some Nepali refugee camps where they had persons who were thrown out of Bhutan, so I am aware of some of the issues involved in this. You have been a migrant. What does that mean to you? 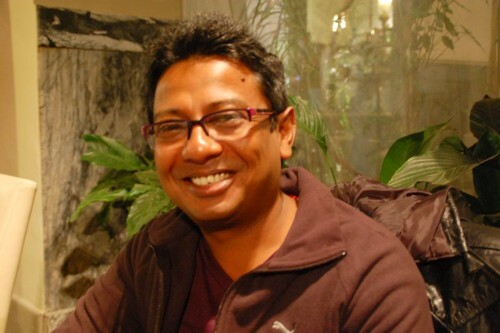 Onir: My leaving Bhutan was linked to the Nepali exodus. My father was principle of a school where they had Nepali children. There ten Nepali students were arrested and next day they were found hanging. So my father resigned and moved to Kolkatta. Though I was born and brought up in Bhutan, they decided that people who are not of Bhutanese origin, will be second class citizens in that country, so we had to decide what to do. I didn't want to be a second class Bhutanese citizen, I preferred to be Indian citizen. However, when I talk of home, in my mind, my home is the place in Bhutan where I was born and where I grew up. Due to this reason the story of Megha in "I am" is very special to me, because it is about homelessness. When I came to Kolkatta, though I was a Bengali, I was an outsider. Then I went to Berlin, and there of course, I was even more of an outsider. Then I came and settled in Maharashtra, where language and other things make me a little outsider. I agree with you that where ever you live becomes a home, and at the same time, you are always an outsider. I have some very very good friends in Berlin from the days when I was a student there. So there I feel absolutely at home with them, and with them I don't feel that I am an outsider. But at the same time there are things - like the time when there was this bomb blast in London. I was travelling in Berlin in the S-Bahn and suddenly I realized that I was the only brown person on the train and everyone was looking at me. So it was a kind of strange feeling that I had. But I also have such feelings in Bombay when ever there were those Maharasthrian things .. I travel a lot by local trains and I feel that if you don't know the local language, then the place is not as friendly. Where ever we are, at the time of conflicts you realize that you are an outsider. Sunil: Did you ever go back to Bhutan? Onir: That experience is what has influenced Megha's story in "I am". In the story she is back home after twenty years. I had gone back to Bhutan after about thirteen years. Emotionally it was a very exhausting period, to go to the same old house and find other persons staying there. At the same time, there are so many things from your memories that are still the same there. But after that one experience, I didn't want to go back there, because emotionally it was very painful. Sunil: Salman Rushdie in one of his books had written about "imaginary homelands" that we emigrants carry in our hearts, but these homelands are only spaces in fantasies, because when you do go back, you realize that it is not the same place anymore. When I go back to places of my childhood, the differences between the reality and my memories always strikes me. Like to go back and find that the "big square" of my memories is actually a narrow little space. Did that happen when you went back to Bhutan? Onir: I realized that all my friends were gone and the few there were .. in Bhutan, people get married very early, so there were these old friends with three kids and I realized that our worlds had grown apart a lot. When I went to our old house, I immediately spotted this tree, I loved gardening and I had planed that tree, to see it was very emotional, though it was a small thing. Then inside the house, where we had our fireplace, the hole above it for the smoke was still there, though they had shifted the fire place .. so there were so many small things that brought back old memories. Sunil: Your decision to get in to films came at a time when the TV and media revolution had not yet taken place. So how did your family react to it? Onir: My parents were keen that I become a doctor. They wanted one son to become a doctor and the other son to become an engineer. After school, I came to study in Kolkatta and my father got me admission in the science college. He was thinking that after the science college I will try to go to the medical college. After he went back, after one week I applied for a literature course in another college. I shifted there and only after my name was cut off from the science college, I told my father. So first there was shock in the family that I was doing literature and arts. Then I started doing very well in literature so my father was happy, he started saying that I will become a professor. Then one week before the finals of my post-graduate course, I quit and came to Berlin to study cinema and that was another shock to them. They were worried that we had no connection in Bombay or in the film fraternity, and Bombay is a very family driven industry, so were worried. When I managed to my first film, it took me ten years to do it in Bombay .. I knew that this was my goal. I also knew that it will take time, and I was patient. I never thought, oh my god, it is taking me so long, etc. I knew that I was going to do it. When they finally saw my film ... and even now, they know that I have zero savings, I don't have a house, I don't have a car, what ever I earn goes back into film making because that is what makes me happy .. but now I find that they are happy about my work and they share my happiness when my films get made. I know that they are worried, but they are also proud of me. Sunil: Did their other son become an engineer? Onir: Actually he went into research. He did do computer engineering, but he liked physics. He went to do physics at Presidency college and I know that my parents are very proud of him. He has recently won the highest award that a scientist can get in India. I don't remember the name of the award, but it was given by the Prime Minister of India, about one month ago. He is very well known in his field of work. My parents never really pushed us .. and now they are happy about both of us. Sunil: You said that they were happy when they saw your first film, but that film (My Brother Nikhil - MBN) had a theme that may not have been very easy for your parents? Onir: I was also worried about their reaction .. regarding the sexuality issue. My mother called me from Kolkatta. I was in Bombay and she had just seen the movie and was in tears. And she said, "..but couldn't you get a better looking man opposite Sanjay?" (laughs) And my father said, "I was never so nasty as a father" (laughs) and I had to explain that film's father was not you. Their reaction was very interesting. About my dad, I was very moved because I had gone to New York for a screening of MBN and at the same time there was the first GLBT film festival in Kolkatta and my father went there. He went up on the stage and said, "I am very happy that you are giving him an award but I would rather you all paid a ticket and went to see the film in cinema theatre and not to see it free here." Sunil: Actually when I had seen MBN, though it was a daring theme in Indian cinema, I had also thought that to show he is gay with a very strict authoritarian father was a kind of stereotyping. Another thing that had struck me was in terms of film's structure, I had thought that it very similar to an American film called "Jia" with Angelina Jolie. Sunil: You have also been a song-designer for "Daman". What does that mean, to be a song-designer? Onir: I had first done some song editing for Kalpana (Lajmi) and it was my first film work. When she started "Daman", she asked me to be the editor and it was my first film as an editor. For me it was an important step to get into films. I had liked her "Rudaali" and "Ek pal". As an editor I wanted to be on the sets and see what was happening, even if most editors don't do that. I knew that I wanted to be a director, so I wanted to see and learn as much as possible. So when she asked me, "Do you want to come" I said, "Of course and I will give whatever help I can give". She knew that I had a sense of the music, so she asked me, "Do you want to direct the songs" as she didn't have money for a choreographer. I immediately said yes. Before that I had already produced two music albums with Pritam. I had brought Pritam in film industry. Even there, he was composing the songs while I was a kind of song designer. There are different elements in the songs, and a song designer influences how those elements shape up, there were a lot of discussions and I was also involved in those. Decisions like what kind of singers, how many singers, what kind of instrumentation, what kind of song, etc. So I was part of the song design. In "Daman" I was involved not only in the process of music recording, I also went on the sets and started shooting the songs. This experience with Kalpana was great because she had a small unit. Most of the assistants there were working on the film as a job, but they didn't have the passion. I was waking up early, I used to go to the sets take care of the art, check the costumes, etc. I didn't want more money but I wanted to learn as much as possible from all the different departments. So that when the time came for me to my film, I will be less dependent upon others. Sunil: There was an interview of another person from south, who has worked with you on "I am" ..
Sunil: In this interview, he had said that you are very well organized and you plan every thing in advance. Do you think that you are a "perfectionist" kind of person who wants to control every thing? Onir: It is more about planning .. I have always been the producer of my films. And I have always made my films with extremely tight budgets. "I am" was shot in 24 days and MBN was shot in 28 days. For me planning and preparation means that I am not sitting on the sets wondering what to do next, what shot to take, etc. All that has already been planned and on the sets, I do a lot of home work. On the sets, I spend more time with my actors to prepare them for the scene. Money and time are important resources, it is extremely important to respect what you have and to get the best out of it. For this self-discipline, I thank my Berlin days. Discipline is something I learned there. Sunil: You also did some work for Ram Gopal Varma? Onir: I did editing of some promos for his film "Bhoot". It was a nightmare working for him but any way ..
Sunil: I think that it is appropriate that working on a theme like Bhoot (ghosts), you have nightmares .. but my question is about other film makers and how they have influenced you? Onir: I don't have an icon or an idol. I love the works of lot of different people who are good film makers, ... but the person who really inspired me to get into films was an experience when I was very young. It was because of the images from that film that stayed with me, very strong imagery that made me dream and want to become a part of films. That was Shyam Benegal and the film was Junoon. I was really young at that time and I didn't understand so much, but the visual impact was so strong that it made me desire to become part of the films ..
Sunil: Junoon was good .. I remember its premier at Chanakya in Delhi, where Shyam Benegal had come with Shabana Azmi and Deepti Naval... I read some where that you have some three old scripts and you are working on one of them with NFDC? Onir: It was my first script and now I am reviewing it .. NFDC has been a partner in developing that script and I am planning to make it after "I am". Sunil: Are there other old film scripts that are waiting to be made into films or are they part of a development process? Onir: They are not ready for developed into films .. they keep on getting modified. I always keep on writing. I can't sit idle. When I am waiting for something, I will start writing. I write new scripts, I develop ideas, may be some of them will some day become films, may be not ..
Sunil: I wish you would make a musical. I like the music of your films. I loved the music in MBN. Onir: MBN was at Milan GLBT film festival and it won the audience choice award. I remember the next day, a group of Italian men came to me and started singing "Le chalo ..", it really touched me. Sunil: OK Onir, thanks for this interview. I really enjoyed talking to you. Great Onir...Read the interview...Privileged to have you as my friend! Want more films from you!